Salesforce announced last year that it spent $3 million to close the gap between what men and women make. Now the tech company is doubling down on its commitment to equity. Salesforce said Tuesday it has raised the pay of 11% of its employees around the world after another evaluation of salaries. The changes, which cost an additional $3 million, took effect Saturday. The company examined salaries last year, comparing people with similar roles and adjusting for location, then corrected "unexplained differences" between men and women. As a result, 6% of employees had their pay raised. Both women and men received boosts. This year's study also looked at bonuses and checked for differences in pay in the United States based on race and ethnicity -- not just gender. "The need for another adjustment underscores the nature of pay equity -- it is a moving target, especially for growing companies in competitive industries," Salesforce executive Cindy Robbins said in a blog post. The company, which provides cloud-based customer service tools for businesses, had 25,000 employees as of Jan. 31, according to a company filing. That means about 2,750 workers had their salaries adjusted this year. The announcement comes on Equal Pay Day, which symbolically marks how far into this year a woman would have to work to make her pay for last year equal to a man's. And it makes good on a longstanding promise from CEO Marc Benioff. He told The Huffington Post in April 2015 that Salesforce was examining employee salaries and would take steps to ensure men and women were paid equally. 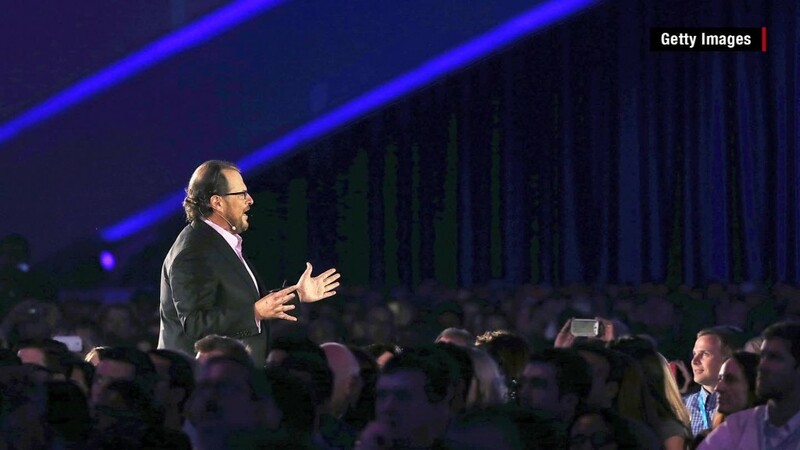 "My job is to make sure that women are treated 100% equally at Salesforce in pay, opportunity and advancement," Benioff said at the time. Concerns about the treatment of women at tech companies have only ratcheted up since then. Problems at Uber, in particular, have put Silicon Valley under the microscope. Uber CEO Travis Kalanick to had order an "urgent" investigation in February after a former employee made allegations of sexism and harassment in a widely-read blog post.